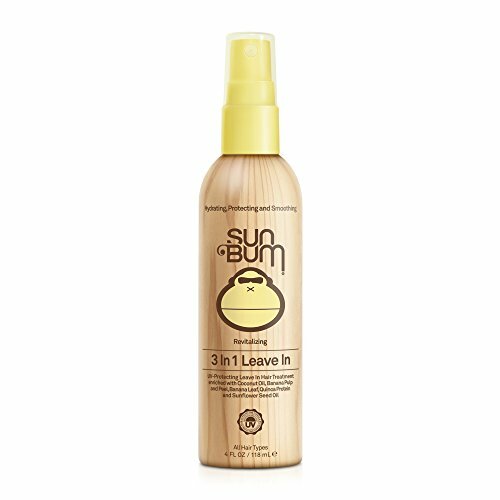 Sun Bum Beach Formula 3-In-1 Leave-In Conditioner is, by far, the most "borrowed" item from our beach house and is perfect for all hair types! It instantly penetrates the hair shaft without weighing the hair down. It protects, detangles, and conditions your hair while enhancing and restoring its natural body. It controls frizz, prevents split ends, slows color fading and will leave your hair silky-smooth and shiny. This spray also shields hair from sun and wind damage and is humidity resistant. Sun lovers rejoice! Protection from damaging UV rays, helping prevent your hair from becoming dull, brittle and discolored. Made in the USA with friendly, vegan ingredients that will hydrate, protect & smooth your hair without causing scalp irritation - Paraben Free, Silicone Free, Alcohol Free, Gluten Free, Dye Free,Cruelty Free.